Influencing policy may seem far beyond the reach of the community, but with the help of the newly formed Public Participation Networks (PPNs) throughout Ireland, it may just be possible. The PPNs are a community initiative that gives a voice to locals in council decisions and policy creation. The system is a relatively young initiative – introduced in 2014 – but already people are using them to achieve real positive change for their locality. How does the PPN work? There is a Public Participation Network in every county and any charity or not-for-profit group, from the smallest community garden to the largest environmental NGO, can sign up. It’s free to do so and extremely worthwhile. Not only can you affect decision making on a county level, but your group receives important information about what is happening in your county such as public consultations and funding opportunities. Member groups can also use the PPN to communicate with other environmental groups in your county. The PPN is made up of three colleges: Environment, Social Inclusion, and Community & Voluntary. These three colleges all have equal representation on the PPN Secretariat, ensuring that there is an equal voice present for all aspects of community life. Each PPN has a Resource Worker, who oversees the running of their county’s PPN. Members of any group that joins the PPN can get involved in committees, such as the Secretariat, Strategic Policy Committee, Local Community Development Committee, and Linkage Groups. 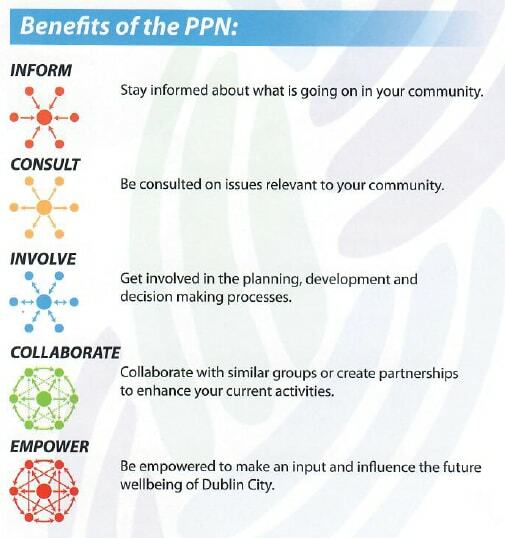 Speaking at the Dublin Environmental Gathering in April, community group representatives told attendees how they use the PPNs and why we should be using this resource to our advantage. Catherine O’Toole, Development Officer at the Environmental Pillar, spoke to community representatives who are involved in their PPN about their experiences so far. 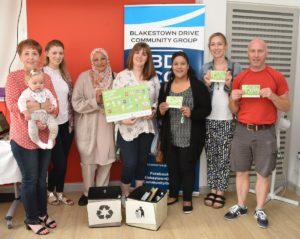 “Being active members of the PPN has offered us opportunities to connect with likeminded people in the community, and to include community and social inclusion groups who all have a role to play in stewardship of our environment,” said Maria Tormey of the Blakestown Drive Community Group. At the Gathering, Maria showcased many projects that her group has undertaken such as Project Noah. This project saw her group coming together with the local Men’s Shed to build wooden frames planted with pollinator friendly flowers around lampposts, trees and other street furniture. “The PPN is allowing us to showcase our own projects as a means of passing on the benefits, through active participation, of undertaking sometimes small yet definitely important contributions to the protection and appreciation of the ecology of our environment,” she explained. 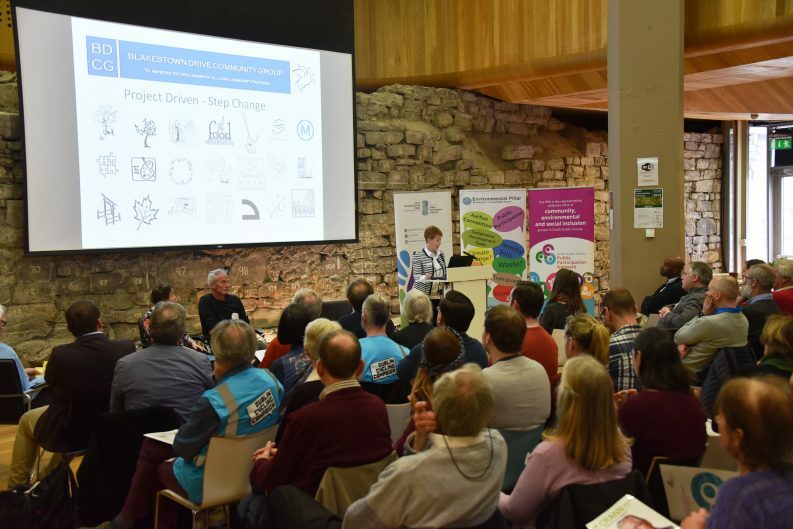 “For example, through connecting with organisations at the PPN plenary and Dublin Environmental Gathering we recently hosted our own environmental event, under Project Tobermory with the assistance of Voice Ireland,” she added. “We were in fact also able to introduce Voice Ireland to other organisations in the community and a number of recycling workshops have been booked in Dublin 15 which will benefit where we live. 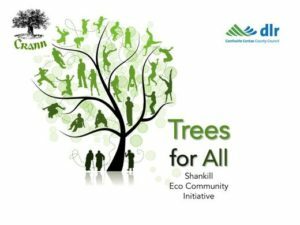 Diarmuid MacAree, a member of Crann and of his local Tidy Towns, showcased their project entitled Shankill Trees for All which aims to plant a tree for every resident in the Shankill area. Using the 2006 census, they needed to plant 13,242 trees. To date they have planted over 15,500 trees, using the guide of ‘the right tree in the right place’. They champion community participation and urge everyone to get involved, even local councillors. As Diarmuid says: “Councillors are delighted to be seen planting a tree!” It makes for a great photo opportunity and is a good way of spreading news of the project. 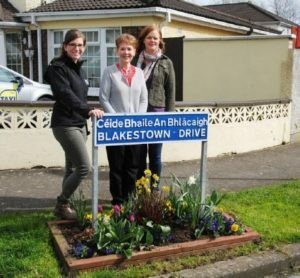 Diarmuid and Crann are using this project as a template for other Tidy Towns groups as a successful way to create green spaces in townlands, and it is catching on around the country. There is massive potential to use the PPNs to the community’s advantage. Linkage Group meetings are the first port of call for voicing your concerns and ideas. These meetings are open to all members, not only elected representatives. A Linkage Group will meet to discuss a topic, for example, the Environment Linkage Group. At this meeting, issues will be examined and possibilities for how to address an issue will be discussed. The Linkage Group pools their knowledge into creating questions to be taken to the next stage, the Strategic Policy Committee. As well as being involved in Shankill Trees for All, Diarmuid is also a representative for DLR PPN on Dún Laoghaire-Rathdown Council’s Environment, Climate Change & Energy Strategic Policy Committee. At the Dublin Environmental Gathering, he spoke about the challenges in getting involved in the PPN, and the support he received from his Resource Worker, Laura Howe. “I felt a bit isolated at first, but I spoke to Laura, read the constitution that shows what we can do, and now know that we can speak directly with councillors and make changes based on what we want to see happening,” he said. Speaking about his project, he explained that the PPN is a forum where we can “influence the biodiversity of the area”. “There is a symbiotic relationship between ourselves, the PPN, the Parks Department and our councillors. We take our councillors on biodiversity walks through the area, so we have a very nice working relationship. Laura has published our work in the PPN newsletter, and provided us the chance to speak at the Dublin Environmental Gathering,” he added. Justin Byrne, who sits on the South Dublin SPC, gave some practical advice about getting involved. “Change is slow, and people forget that. It’s important for PPN representatives to remember to be proactive at an SPC meeting. SPC reps should be looking at policies that interest their Linkage group, keeping an eye on upcoming policies, and actively creating detailed needs at each Linkage Group meeting. “An SPC only meets four times a year, so by the time your policy is heard, reviewed and acted upon it could be year later. However it’s important to work with the system that we have and change it from within. Robert Moss, on the Dublin City Environment SPC explained that engaging with the SPCs is “where the real power lies”. “You do get to ask questions and you do get answers,” he added. Can PPNs have an effect on a national level? One challenge that the PPNs are facing is cross-county communication. An example from Limerick shows what could be done with more communication and collaboration between PPNs, their members and their committees. In June 2017, the Environment Linkage Group of Limerick PPN put forward a motion to the council to ban balloon and sky lantern releases in the county. The Linkage Group proposed this ban on account of balloons and sky lanterns that are released falling back to earth as litter. The motion outlines dangers such as fire hazards, littering across the country and in the oceans, and health concerns for wildlife. It also outlines safer alternatives to these releases such as flying kites, using ribbon dancers, or throwing seed bombs. It called on the council to “actively promote alternatives when implementing a ban” . Sharing the motion with the Limerick Environmental Network in March, Anneke Vrieling explained the process. “When it was discussed at the SPC everyone agreed with it in principal, but the department’s reply was it should be legislated for nationally rather than regionally. It was brought to full Limerick council and from there to the national government. I don’t know if there was any reply from the national government so far,” she said. When asked if they will put forward the motion again, Anekke replied: “I don’t know if that would be strategically clever to be honest. I expect the council’s reply to be much the same, regardless of the Cork ban. With the uptake that this issue received and the work that was being done on it around the country, a Facebook page was set up to co-ordinate future efforts. Stop Balloon Releases Ireland is the result of co-ordination efforts by people in the community who care about this issue. However, had these efforts been coordinated before the motion was rejected in Limerick, the response from the council may have been different. This highlights the need for better communication between those involved in the PPNs, but also stands as evidence to the possibilities for creating change on a national scale in the future of the PPNs. What can you do for your PPN? There are many benefits of joining your PPN, but what may be the most beneficial to your community is not what it can do for you, but what you can do for it. By signing up your group and actively engaging with the PPN, you can provide it with valuable community input. It is a tool for the community. If it is not used, it will disappear. This article was first published on IrishEnvironment.com. Re-published with thanks.